During the course of my hiatus, I have received multiple requests to do a “Yaffa Come Back” to the public venue and converse with various groups. I repeatedly decline, because the multitude of baby rapists in the world cause me to refrain from leaving my child with anyone else. Unfortunately, I cannot determine who to trust, because these predators exist in all genders, ethnic groups, religions, and age brackets. Even so, I have been told that the current political, as well as racial climate out there has caused many of my listeners to request my feedback and input on the escalating hostilities, because many are curious about how to proceed from here. I have even been blatantly told (by more than one listener) that my hiatus has been long enough, because people need to hear my perspective and that I should not simply sit back and remain silent at this critical time. So, as a result, I have determined that I am willing to do a “Yaffa Come Back” return to the public venue on the sole condition that I can bring my child with me WITHOUT imposing on anyone, or leaving her anywhere. The only way for me to accomplish that is in a small Class C RV motor home that allows me to bring her along with me. Moreover, it would be economically easier on the groups requesting me if they could avoid paying my way there, my way back, my hotel stay, fuel to pick me up from the airport, fuel to return me to the airport, etc., because my food, lodgings, and transportation would be all inclusive inside the “Class C RV” itself. 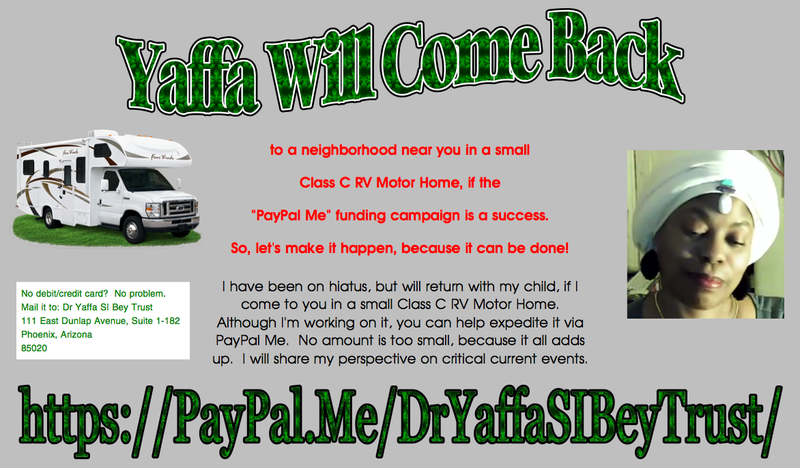 Therefore, if my listeners are willing to help me acquire what is required to invest in a small “Class C RV” (through the PayPal Me campaign that just launched), then I will gladly get on the road and bring myself to a neighborhood near you for a “Yaffa Come Back” presentation. If we are able to pull this off, then I shall see you all sooner than later. Thank you all in advance for your past, present, as well as future, support.